The TeleVox Healthy World Report is based on a survey of a nationally representative sample of more than 2,200 healthcare providers representing a variety of specialties and disciplines. In addition, TeleVox also worked with Kelton Research to survey a nationally representative sample of 1,015 Americans ages 18 and older. Both arms of the study were conducted using an email invitation and an online survey format. According to the report, U.S. healthcare costs are rapidly climbing with total expenditures nearing $2.6 trillion. Medicare costs alone are growing by 3% every year as more and more Baby Boomers — someone born during the demographic birth boom between 1946 and 1964 — become eligible for benefits. Indeed, more than 10,000 Baby Boomers are turning 65 everyday — that’s one person every eight seconds that qualifies for Medicare. The program will expand healthcare coverage from 47 million people today to 80 million in 2030, and Medicare costs are projected to balloon from $519 billion in 2010 to $929 billion by 2020, an 80% increase over 10 years. The annual cost for each new Medicare beneficiary is $7,700 and rising. The Centers for Medicare and Medicaid Services predict the program will run out of money in 2017. The Patient Protection and Affordable Care Act (PPACA), which was signed into law two years ago (March 2010), represents the start of an effort to lower costs without compromising care by linking patient payments to health outcomes. The goal is to improve the health of individuals and communities and slow the growth of costs in the United States, which spends more per capita on healthcare than any other advanced nation. As more Baby Boomers enter the Medicare program, it will be even more important to help them lead healthier lives. According to the TeleVox Healthy World Report, more than half (56%) of Baby Boomers already do not feel their overall personal health is in good shape. In fact, one in four Baby Boomers (26%) say they’re struggling to be healthy. One of the key strategies for Medicare implemented by the PPACA is a focus on preventing illness through efforts including increased preventive health screening services and advising seniors on how to live healthier lives. The new Medicare wellness benefits task doctors with creating personalized prevention plans tailored to each patient’s daily routine, mental health and family life. However, the TeleVox Healthy World Report finds that patients aren’t scheduling wellness visits. During the first nine months the benefits were in effect, only 1.2 million Medicare beneficiaries out of 31.5 million seniors (4%) had a wellness visit. Many patients weren’t even aware that they are entitled to such a benefit. Moreover, some physicians are hesitant to proactively communicate the benefit to their patients because they’re concerned about the financial impact on their practices. Besides creating complex billing challenges, wellness visits require a significant amount of time per patient. Wellness visits include a basic check of patients’ weight and blood pressure, updates to family and personal medical histories, assessment of cognitive abilities, identification of health risk areas, and a discussion about how to stay healthy. Patients also need the centerpiece of a patient care strategy: the personalized wellness plan. Based on identified areas of risk, physicians are expected to work with their patients to schedule the appropriate preventive benefits. The free preventive benefits provided under the PPACA include services such as flu vaccines; smoking-cessation counseling; regular mammograms and preventive screening for diabetes, colon cancer, and prostate cancer; and free screenings for blood pressure, body mass index and depression issues, among other services. 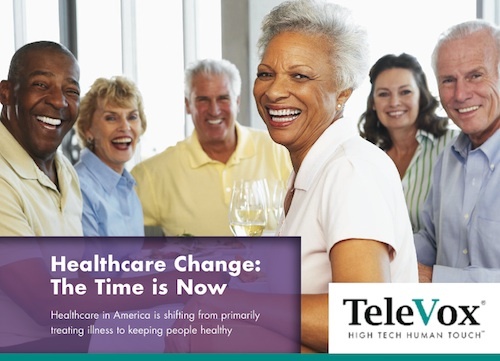 Although a personalized wellness plan is critical to a patient care strategy, the TeleVox Healthy World Report revealed that two in three (66%) healthcare practices aren’t prepared to meet the demand of millions of Medicare beneficiaries and create personalized prevention plans tailored to each patient. And despite the fact that physicians are now being reimbursed by Medicare for talking with patients on an ongoing basis about healthy behaviors, 71% of healthcare practices surveyed report being unprepared to engage patients throughout the year with communications that help them adhere to their personalized prevention plans. As medical practices adapt to the new healthcare requirements, they will be increasingly rewarded for outcomes that are best achieved by proactively managing care through preventive treatment plans and following through on those plans. The time required for this level of personalized engagement by physicians, nurse practitioners, or other staff — for thousands of patients in a practice — is perceived to be unrealistic. However, this degree of personalized care is possible when healthcare practices leverage multi-touch, multi-media notifications technology to automate follow-ups with patients that encourage them to schedule tests and doctor appointments, provide just-in-time medication reminders, and support them in making positive behavior changes to create a healthier lifestyle. By the time the majority of Baby Boomers turn 65 and qualify for Medicare, they’re expected to have five or more chronic diseases, see 15 physicians and average more than 40 doctor visits a year. In the new outcome-based healthcare system, regular communications offering information, encouragement and ‘just-in-time’ reminders will help doctors to support patients as they work to become healthier individuals. Perhaps in the coming year, TeleVox can quantify patient accountability and outcomes in a follow-up study comparing patients of healthcare providers that leverage multi-touch, multi-media notifications technology to those that do not. Healthcare Change: The Time is Now. TeleVox. 2012 Apr. TeleVox Study Reveals Healthcare Providers Unprepared to Meet Demand of Medicare Beneficiaries Now Eligible for Wellness Visits. TeleVox press release. 2012 May 8.